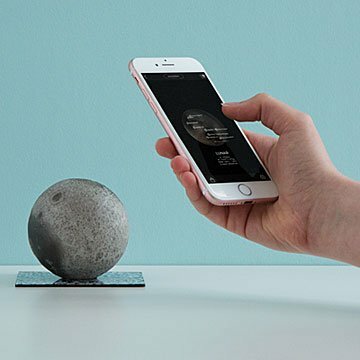 An interactive model and desktop sculpture that lets you explore the surface of the moon. This interactive model of the moon is one small step for man, one giant leap for high-tech, educational exploration. The adventure begins with a 3D printed, hand-painted model of the moon. Based on years of data collected by NASA's Lunar Reconnaissance Orbiter, the topography of the moon becomes something you can explore with your fingers, from the basalt plains that give the Man in the Moon its "face," to the craters and highlands that can never be seen from earth. But while this mini moon is fun to explore and beautiful on display, it's in augmented reality that the experience really takes off. Use the app on your smartphone to unlock history, photo, video content, and more, all visually linked to the relevant points on the lunar model. It's an educational experience that will have minds of all ages reaching out to new frontiers. Handmade in China. Compatible with all smartphones using the AstroReality app. This is really high quality and beautifully made. The app is easy to use and works great!